Love the LOTV image its so sweet...We shall look forward to seeing you use your new goodies. Gorgeous christmas card Sylvie, I like the fab image, the papers and that snowflake. 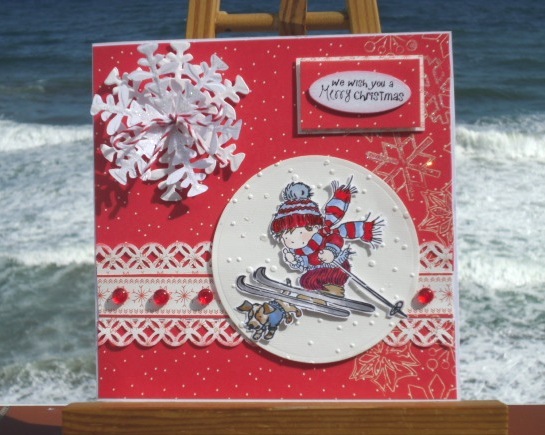 Such a cheerful card Sylvie and I love the skiing image he's gorgeous! The snow embossing is so effective. Brilliant card Sylvie, love the background colour and cute little image. Need to go and make mine:( Have a great weekend. Lovely card, Sylvie. I love the punched detail, the red gems and the gorgeous coloured image. Unbelievable no winter at all and such a great winter inspirations on your blog. Sweet stamp! Hi Sylvie this is absolutely fabulous, I do love that cute image and the design is perfect. Love it Sylvie.....glad you enjoyed my challenge. Such a great image and I love the snowflake. Have a great few days away. Hi Sylvie, wow, this is so lovely, love LOTV images and the snowflake is fab. Loving the colours. Sounds like you had a super week in the UK! Enjoy your BH today too! Beautiful card, he is just perfect to raise a smile in the middle of winter! Gorgeous - wonderful - grand!!!! Here I am back again because I love this card with a passion!!!!! Lovely cards designs with bright colour combinations.This cards designs are so interesting craft work.This is special card for the gift for the special one. Less is More Take Three!!!! Congrats to Claire and Mark!!!!! And the Winner is Drum Roll !!!!!!! !